50030 ETH Overvolt Relay HOVR board April 2011 This is the board mounting the ETH overvolt relay (HOVR) & resistors Z23, Z24 & Z69, which is seen in April 2011 shortly after it had been test mounted in 50030's electrical cubicle, but had not yet been properly fitted and wired in. 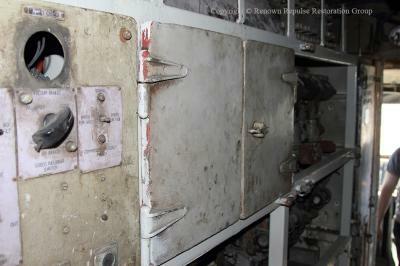 The components on the board have all been cleaned, checked, tested and overhauled as appropriate. 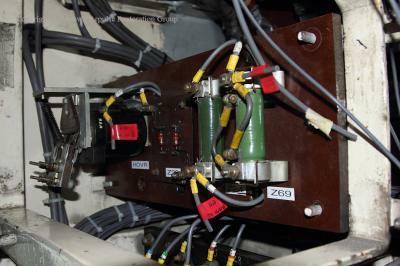 This is the board mounting the ETH overvolt relay (HOVR) & resistors Z23, Z24 & Z69, which is seen in April 2011 shortly after it had been test mounted in 50030's electrical cubicle, but had not yet been properly fitted and wired in. The components on the board have all been cleaned, checked, tested and overhauled as appropriate. 50030 Generator Field Relay Board April 2011 This picture shows the board containing the overload interlock relay OIR, generator field relay GFR & no.1 motor blower relay BMR1, after fitting into 50030's cubicle. All of the components have been serviced and are seen in the process of being wired into the cubicle. 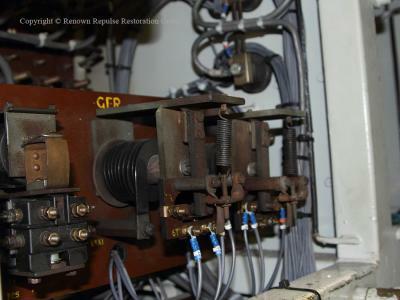 This picture shows the board containing the overload interlock relay OIR, generator field relay GFR & no.1 motor blower relay BMR1, after fitting into 50030's cubicle. 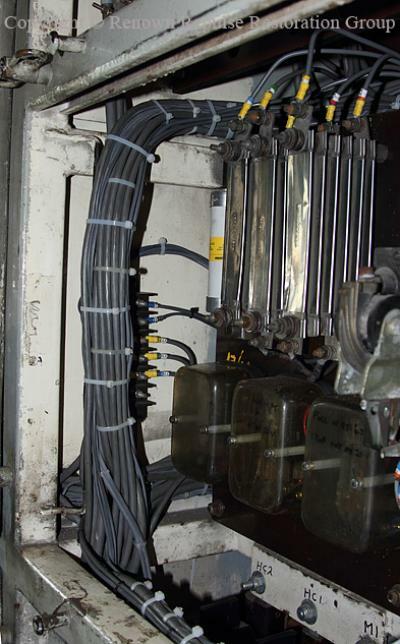 All of the components have been serviced and are seen in the process of being wired into the cubicle. 50030 Wheel slip relay board April 2011 This is the main wheelslip relay board with it's associated (silver) resistors above, and the 150amp rad fan fuse just visible behind the resistors. The components are a mixture of overhauled parts and new components and are seen in the process of being wired to the cubicle. This is the main wheelslip relay board with it's associated (silver) resistors above, and the 150amp rad fan fuse just visible behind the resistors. The components are a mixture of overhauled parts and new components and are seen in the process of being wired to the cubicle. 50030 Repaired Fuse cupboard cubicle doors April 2011 This picture illustrates the fuse & MCB compartment doors on 50030's electrical cubicle after Chris had fettled them to make them fit and actually open and close properly! 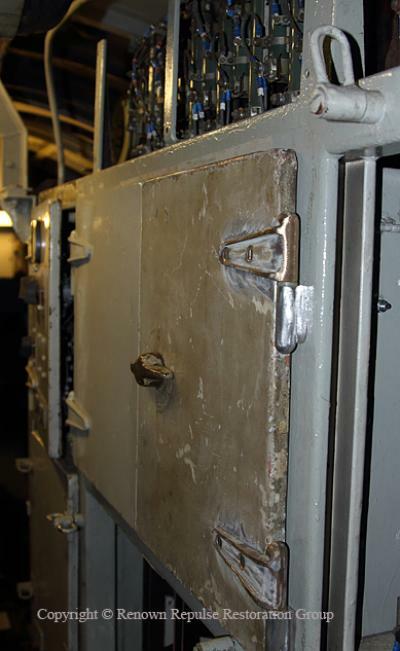 This picture illustrates the fuse & MCB compartment doors on 50030's electrical cubicle after Chris had fettled them to make them fit and actually open and close properly! 50029 Repaired fuse cubicle doors April 2011 As with 50030, (whilst in the swing of it), the fuse cupboard doors on 50029 have been un-seized. As with 50030, (whilst in the swing of it), the fuse cupboard doors on 50029 have been un-seized. 50029 Replacement rotary switch cubicle door with new hinges April 2011eb copy Also in 50029 a replacement cubicle door that contains all of the rotary switches has been sourced (the only item missing is the ammeter), new hinges have been fitted and the door fitted to the cubicle. 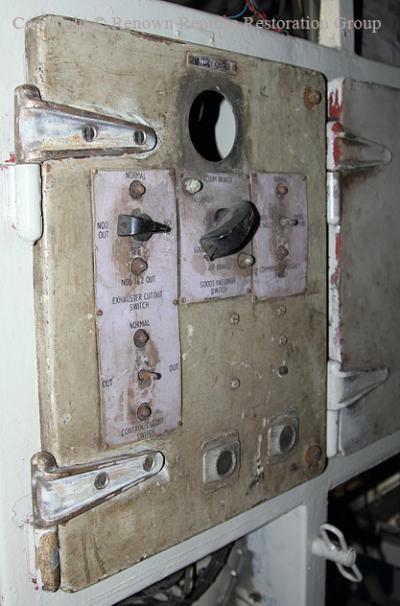 Also in 50029 a replacement cubicle door that contains all of the rotary switches has been sourced (the only item missing is the ammeter), new hinges have been fitted and the door fitted to the cubicle.